On the last day of Lakme Fashion Week 2018, all the Bollywood beauties graced the runway with their stunning walk in their best outfits. However, the one who left us awestruck was Aditi Rao Hydari. She looked beautiful in Jayanti Reddy's creation. The 'Padmaavat' actor walked the ramp walk in utmost grace and attitude. She has shared the photographs on Instagram. The Lakme Fashion Week 2018 has come to an end. From Kareena Kapoor, Malaika Arora, Neha Dhupia, Janhvi Kapoor, the Bollywood beauties dazzled the ramp with their walk in their best outfits. 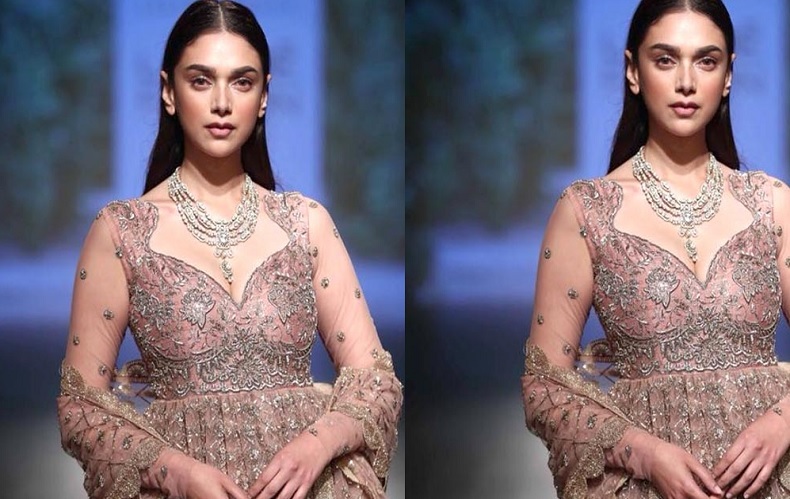 Recently, the ‘Padmaavat’ actor Aditi Rao Hydari walked the ramp walk and wowed us in Jayanti Reddy’s creation. She looked an absolute exquisite beauty while walking down the ramp. Aditi has shared a photograph on Instagram. In the caption, thanking the ace fashion designer Jayanti Reddy to make her look beautiful in the outfit, the actress mentioned that it’s not the beauty outside covered with glitter and shine but in fact, our inner conscious of simplicity consisted of thousand suns which make us beautiful than ever. Donning an off-white pink gown, she looked extremely gorgeous in the outfit. Her necklace as statement jewellery added charm to her natural beauty. She opted for a sleek hairdo to round off her lookout. We just can’t take our eyes off her photograph. On the work front, Aditi was last seen in ‘Padmaavat’ along with Deepika Padukone and Ranveer Singh. Talking about the beauty secrets, recently Aditi revealed that it was important to have plenty of water. She added that water is therapeutic to her, whether it is to drink or bathe in. Our body tended to lose a lot of moisture in the summer, so it was important to regularly replenish the skin’s moisture content for a soft and hydrated skin.